UK Video Tag line: "She dared venture to where even men feared to tread"
“A lot of good action scenes were cut because of the restrictions on time and budget, much to my disappointment and anger then. We ended up with a very slow-moving narrative and a more intellectual film than I had anticipated". To be fair, I’m not familiar with the novel that inspired this movie (it was adapted from the autobiography of Jeannie Gunn, who left high society behind to join her new husband, a cattle rancher, in the Outback in turn-of-the-century Australia), so I have no idea what was dropped from the final cut. 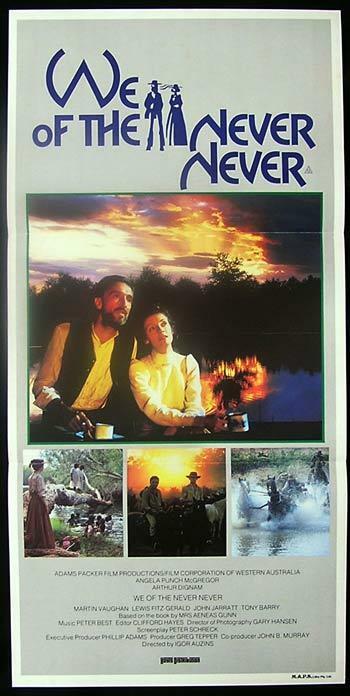 Yet based on what I have seen, We of the Never Never may be heavy on melodrama and a bit too talky, but it’s also stunningly beautiful, and, in my opinion, that goes a long way. It’s 1902, and Jeannie (McGregor) has just married Aeneas Gunn (Arthur Dignam), who recently purchased an interest in a 1-million-acre cattle station near Mataranka in the Northwest Territory. Leaving her friends and family in Melbourne, Jeannie travels to this remote area, ready to assist Aeneas any way she can. But the drovers who have worked at the station for years, including Dan (Martin Vaughan), Jack (Lewis Fitz-Gerald) and Dandy (Wolf Creek’s John Jarratt), resent the fact that a woman has been brought in, and threaten to quit if she interferes with the day-to-day operations. So, to keep the peace, Jeannie tends to her housework, and spends time among the Aborigine laborers, whose camp is situated directly next door to her cabin. Some, including her husband, fear that Jeannie may be getting too close to the native population, and protest when she attempts to “adopt” Bett-Bett (Sibina Willy), an aborigine child whose own mother lives very far away. Angered by the shabby treatment they’ve been receiving, and resentful that she’s been pushed into the background, Jeannie ignores Anenas’ pleas and continues to help the Aborigines. But when a deadly sickness makes its way through the camp, she finds herself playing nurse to blacks and whites alike, both of whom have been hit hard by the illness. It’s clear early on that We of the Never Never was intended to be a big film; with wide angles to show off the landscape and crane shots that carry us high above the action, the movie has an epic sensibility, similar in look and feel to Hollywood classics like Giant and How the West Was Won. As for the performances, all are solid, with McGregor doing a fine job as the dutiful wife who holds her tongue much longer than she would have under normal circumstances. And while there aren’t many action-packed moments, the ones we do get are well executed (including a cattle round-up that nearly ends in disaster when Jeannie wanders in too close). Yet what really impressed me as I watched We of the Never Never was its gorgeous cinematography, which, combined with the picturesque location (the movie was shot where the real Jeannie Gunn resided during her years in the Outback), made for some awesome visuals (the lone Australian Film institute Award that We of the Never Never received went to cinematographer Gary Hensen, and rightly so). Yes, We of the Never Never is a tad schmaltzy at times, and it’s “white woman helping the downtrodden blacks” subplot feels naïve nowadays (especially when you consider how Aborigines were treated in other parts of Australia during this same period). That said, it is an exquisite, well-acted motion picture, and this alone is reason enough to see it. Looks like an interesting movie. If I can find it I'll watch it.